Yesterday morning at 9:00am we set out with our hiking partners Bob and Denise, with a goal of getting to the overlook behind the town of Etzatlan. Ruth and I have done this walk before, and it winds through the valley with a steady uphill gain on a quiet dirt road. Once again, it was a beautiful day with clear blue skies. High 28C (82F), low 9C (48F). Looking back at the road we had just walked on. There is an old processing plant of some kind related to the silver mines that used to be here. Nice views.. we have now gained about 1,000 feet. We made it to the lookout, but it was still early. So we continued on up the road. We gained another 500 feet in altitude and we were now at 6,000 ft.
We took a trail that led back to the center of town and we headed for the Mi Casa restaurant for lunch. But it was closed. Yesterday was actually a holiday in Mexico... Benito Juarez Day. So we carried on and found a different restaurant, Hacienda Los Arados. It looked a little more upscale than what we would normally do, but we were hungry and thirsty. The cold beers at 26 pesos ($1.40 USD, $1.80 CAD) each went down very well! Each couple ordered a molcajete. A mixed meat dish that arrives boiling in a baking hot stone grinding bowl. The dish itself gets it's name from the actual name of the bowl.. a molcajete. Sorry for the focus... it was just a quick snap on the camera phone. Delicious lunch, and we would not hesitate to return there. Total bill for the four of us with drinks and tip included was 540 pesos ($28.50 USD, $38 CAD). Back at the RV Park, my Geo Tracker App told me that we had done 17 kms (10.5 miles) at a decent pace of 5 km/h (3 mph). Considering the 1,500 ft altitude gain, we got a good workout. Another fantastic day in Mexico. Great deal on this 30' Long LED Patio Commercial Grade String Lights. Enter code 5G7JEQ6B for a total 50% discount at checkout. Opening page I got a threat notice from a JS-Downloader virus. Just an fyi. Happy you all are having fun! Okay. I don't know anything about that stuff! Yep... definitely enjoying Mexico! 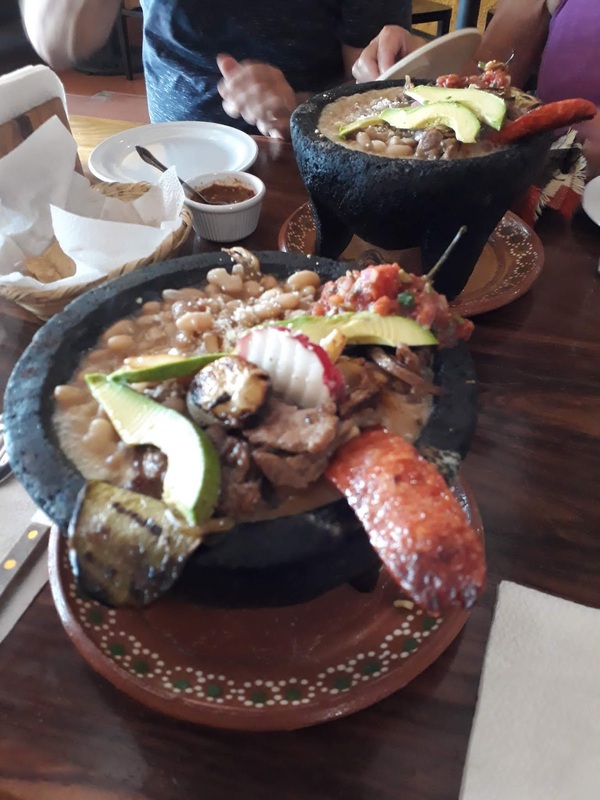 There's a place in San Diego's Old Town that servers the molcajete bowl for $35 for two diners to split. I know ingredients vary, but still $28 for four is a well deserved meal. I got the threat notice as well????? Really enjoying your trip. Wish we were there! Thanks Paul, we will check into that. We have been having an amazing trip this winter, I am sure that you and Marsha would have loved this trip. Maybe next year...? Enjoying your incredible travels in Mexico. Thanks for sharing expenses too. Helps with our travel plans.